And there’s a Kidical Mass ride heading over on Saturday: meet at the Gas Works Park (2101 N Northlake Way, Seattle, WA) play barn at 11am and ride at 11:15ish. Everything sounds great, but I’m particularly looking forward to getting a $5 bicycle portrait by Russ Roca of Path Less Pedaled. 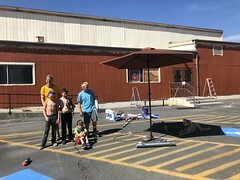 The kids and I rode over to The Building today to meet up with Jesse of A Rebalanced Life and collect some flyers and posters for distributing and hanging. I have to admit that I thought we’d find an abandoned building with Ryan of Go Means Go hanging out, cutting up flyers, but it’s the Swift Industries headquarters. I liked the plethora of cool bikes. One had a Sweet Heart Sprocket. Want! The kids were most intrigued by the dogs, Odin and Loki. Heading back to the Burke-Gilman Trail, we spied the Bicycle Doctor van and admired the stickers blanketing the back. The kids liked the WHO RESCUED WHO? dog paw sticker best. Our first poster-hanging stop was Theo Chocolate where we put a poster outside and some flyers inside. I also bought a $5 Bicycle Benefits sticker which will net me tons of savings around town (and other towns). I didn’t buy the Single Malt Scotch Ganache in my photo, but wow it sounds good! Heading home I got to use the new sharrows at 43rd and Stone Way. I didn’t think I’d ever need them since I ride the bike lane on the right side of Stone all the way up, but half-way up the hill today the two-year old said he needed a bathroom so we quickly crossed over to Big Tree Bikes. Bike stores are often very convenient for mid-bike-ride potty breaks–they usually let you bring your bike in so you don’t have to lock up and this one even has a very clean bathroom (not what I expected, I have to admit). And then we rode a couple blocks up the sidewalk to the bike-and-ped-friendly crossing. I wanted to staple posters along 45th to let my fellow Wallingfordians know about the fun event, but all the phone poles are metal! We even struck out at Molly Moon’s Ice Cream who wouldn’t take flyers because they are paperless. I can appreciate that, but it feels like we didn’t earn the sorbet we consumed. We put one up outside Mosaic Coffee House and will go back out with tape and alert the masses tomorrow. Say, would that be your pink cargo bike in front of the pedlar’s fairs in the photo I just posted? If so, pleased to meet you! Thanks! I had not heard of the ride before! Hope to see you there, Donna! The problem is that I’m helping organize it and I’m not very organized :/ But Cascade and members of the Neighborhood Greenways are involved, too, so it will come together very well. And duh, I should make a poster and put it on the back of my bike!